Colour – Out of this World! When booking an airplane ticket do you request the window seat? For the view? Well Commander Chris Hadfield, Canadian Astronaut, currently living in space aboard the ISS (International Space Station) as Flight Engineer on Expedition 34 has the best window seat ever! And he has been sharing the view. At 370 – 460 kilometers (230–286 miles) above the Earth’s surface the photos that Commander Hadfield has been sharing via Twitter are nothing short of ‘stellar’! The ISS orbits Earth 16 times per day, so the 6 Astronauts living aboard see 16 sunrises and 16 sunsets each day! How cool is that!? I have been following the adventures of Commander Hadfield and I’m in total awe of seeing Earth from the ISS, the beauty of this planet and the wonderful colours of Earth. This is the Golden Gate Bridge, San Francisco. 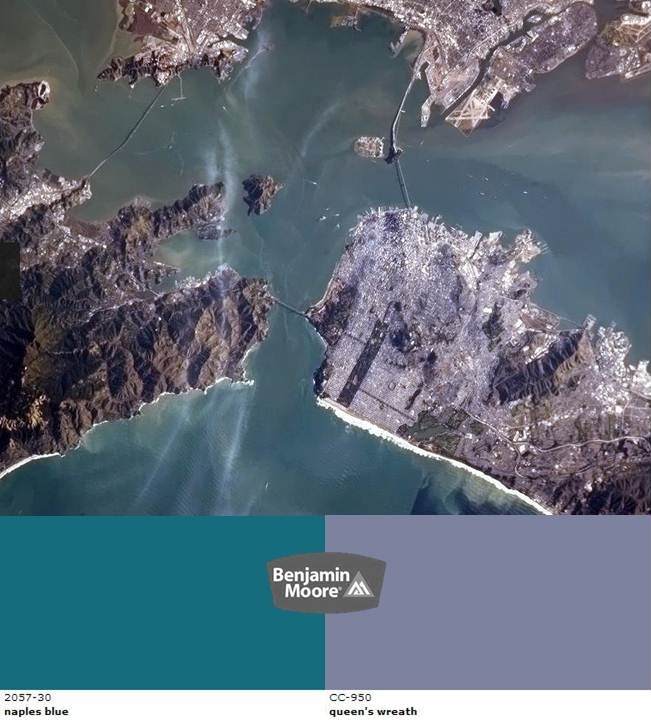 Who would have thought that the ‘City by the Bay’ would be coloured in lavender and teal? 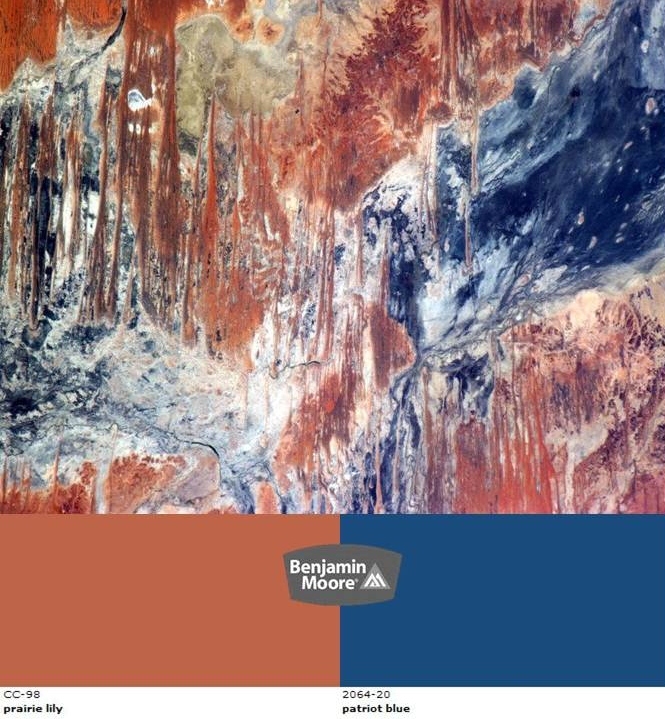 The Outback, Australia looks like a colourful abstract painting of burnt Sienna and deep blues. 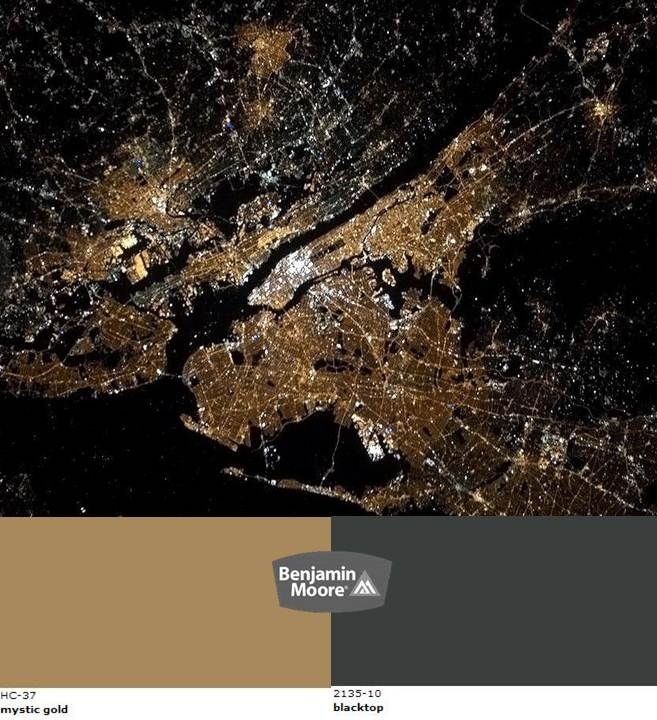 This photo taken at night of New York City matches the colours of ‘a night out on the town’ outfitted in mystic gold and blacktop. 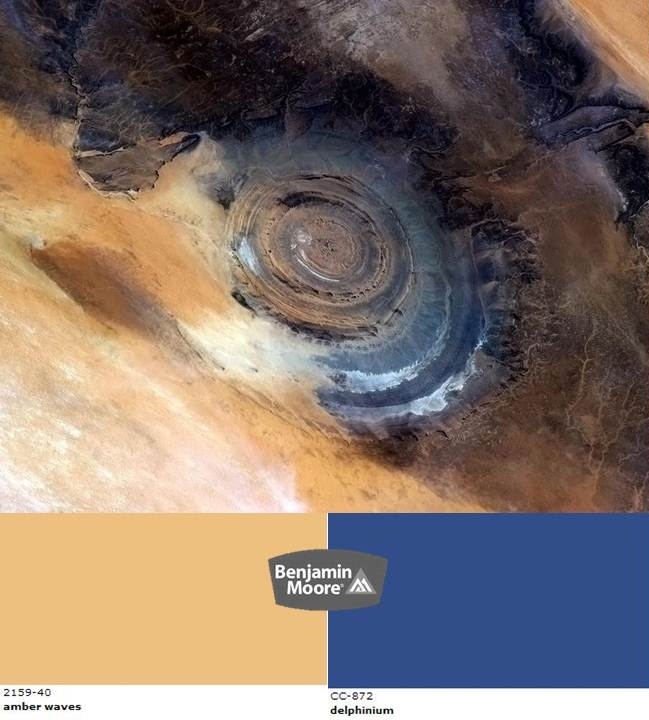 The Richat Structure, a prominent circular feature in the Sahara desert of Mauritania is a beautiful swirling composition of amber and delphinium blue. Thanks for sharing Commander Hadfield. This entry was posted in Colour and tagged Art, color, DECOR, Design, HISTORY, HOME, Inspiration, photography by Modmissy. Bookmark the permalink. What an amazing way to tie together nature and design. Your post was out of this world. Gorgeous post! NYC looks like a counter top design, doesn’t it! Amazing photos. Thanks. Indeed it does. Good observation! I’m glad he’s up there, giving us this amazing perspective. Not my idea of travel! Love this post! I’ve been following C Hadfield’s tweets also and am in awe. I hope there is a nice big coffee table book made of his images. That shot of the Outback looks like a beautiful abstract. Hi Rita – great to meet you. Your artwork is lovely and I have seen it in S@H. Would love to meet you sometime and talk about colour and all things visual! Hi Michele. Thanks so much for the nice words about my art. I’d definitely be interested in meeting up and chatting about art, color etc etc I’m right in the heart of downtown Toronto and there are plenty of places for coffee. drop me an email when your schedule allows.